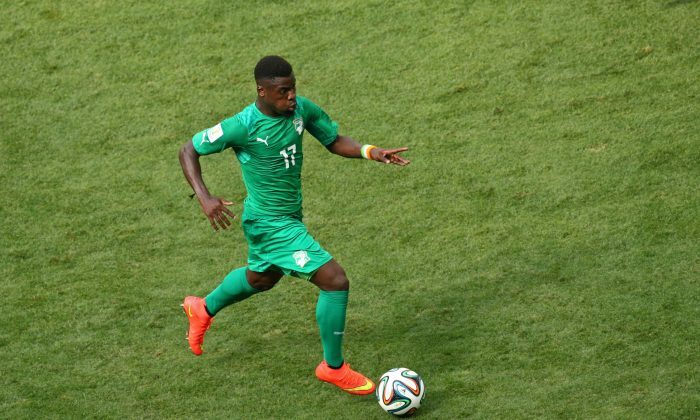 Serge Aurier: Arsenal Fan a QPR, Tottenham Transfer Target? Ivory Coast defender Serge Aurier could be Queens Park Rangers and Tottenham Hotspur’s latest transfer target. According to the Daily Mail, London clubs QPR and Tottenham have checked with French side Toulouse about the availability of their 21-year-old right-back. However, reports in France have it that Arsenal have already agreed terms to sign Aurier, who is a boyhood Gunners fan. The highly-rated youngster is supposedly going for a fee of £8 million ($13.6 million), and will sign a five-year-deal worth £60,000 ($101,827) a week, according to French newspaper L’Equipe. RIO DE JANEIRO (AP) — It looked like the same sad old story at the World Cup for Africa, the continent which still hasn’t quite done it on the big stage. Cameroon was terrible in the first round of matches, African champion Nigeria couldn’t even beat Iran and Ghana lost to the United States. After some early promise, Algeria was overrun by Belgium, playing up to the football stereotype that African teams can be exciting but also careless and naive. Even Ivory Coast, with world-class talent like Yaya Toure, Didier Drogba and Gervinho, couldn’t put it together and initially struggled against Japan. Pele’s prediction years ago that, with a football obsession rivaling even Brazil’s, Africa would emerge as the game’s new force still appeared way off. It probably still is. But with the exception of Cameroon, the Africans have shown grit and skill to fight back. Now there’s a chance that four of their five teams will make the second round, something that has never happened before. Never has more than one African team advanced past the group stage. Three of the countries — Nigeria, Ivory Coast and Algeria — are second in their groups heading to the final games and have good chances of qualifying, while Ghana has an outside shot. After a forgettable first round, Nigeria’s win, Ghana’s fighting 2-2 draw with Germany and Algeria’s all-out attacking show in a 4-2 victory over South Korea has revived the Africans. “Ghana really threw everything they had at us,” Germany coach Joachim Loew said, praising the West Africans for their rapid counterattacks and underlining how African teams — often big, strong and fast — are capable of upsetting the rhythm of the best lineups in the world. Just ask Argentina’s World Cup holders, who lost to Cameroon in 1990. Or France’s defending champions in 2002, beaten by Senegal. Now if only for some consistency. If there’s one thing African teams have struggled with, it’s being able to build on their small successes at the World Cup. Following Monday’s loss to Brazil, Cameroon has won just one game in five World Cups since it broke through to reach the quarterfinals in 1990. Senegal was the second African country to make the last eight in 2002, and yet has failed to qualify for another World Cup. Ghana followed up its run to the quarters last time in South Africa with a surprise loss to the U.S. in its opener in Brazil. Cameroon’s 2014 campaign has been disastrous from the moment the squad refused to board a plane for Brazil over a bonus dispute. Nigeria has also had issues over player payments and Ghana’s buildup to its crucial final group game against Portugal is being overshadowed by British media linking the Ghana Football Association to an alleged match-fixing plan. Yet the majority of African teams are still alive at the World Cup — unlike Spain and England — and their equations to make the second round aren’t crazily difficult. Ivory Coast should beat Group C strugglers Greece, but even a draw won’t hold them back as long as Japan doesn’t upset Colombia. Algeria can afford a draw against Russia if South Korea doesn’t win against Group H leader Belgium. A win and the North Africans sail through. Ghana’s chances are a little more remote.